Pico de gallo (pronounced pee-koh day gl-yo) is ubiquitous salsa we find with most Mexican inspired meals in this country. Pico de gallo is made of any chopped ingredients, such as tomatoes, jícama, nopales (cactus), onions, bell peppers, jalapeño or serrano chiles, cucumbers, and seasoned thousand ways. I am not going to give it’s recipe since there are thousands of recipes online, such as our own Chonti’s famous Pico de Gallo recipe with nopales. I am more interested in why it is called so. 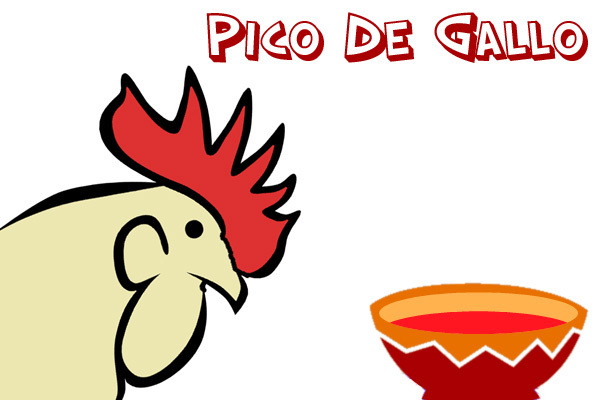 Pico de gallo doesn’t mean fresh tomatoes or salsa in Spanish, but translates to something like beak of rooster. There are a few folklores surrounding why it’s called pico de gallo. For example, people used to pick it with thumb and finger, which resembles a rooster’s pecking beak, or because chilies in pico de gallo reach out and bite like a rooster. 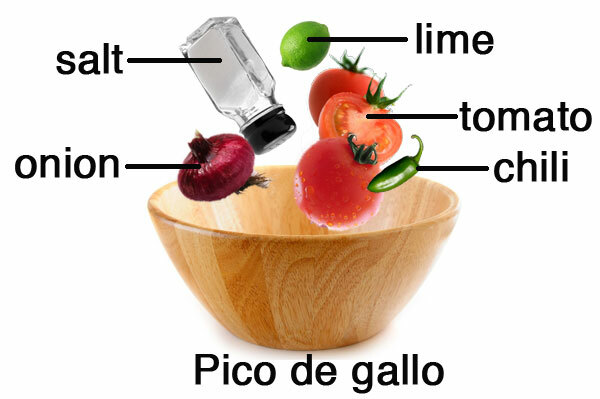 My favorite is pico de gallo is called so because all ingredients are cut into very small pieces, as if pecked by a rooster. What’s yours favorite story on why pico de gallo is called so? Image component based on MS clipart. @Nan Thanks for the interesting factoid about the people eating salad with fingers.